During the Bradenton Farmers’ Market, Split Fire Grill owner, Marcus Anderson, left, and his employee, Heather Gardner, talk with customers Chubby, and Susan Miller, owner of Cork’s Cigar Bar, 424 12th St. W., also known as Old Main Street. For centuries farmers and trades people have gathered in town centers around the world to sell their wares. During these usually weekly gatherings of commerce, townspeople and producers would have a chance to interact and catch up on the latest news. 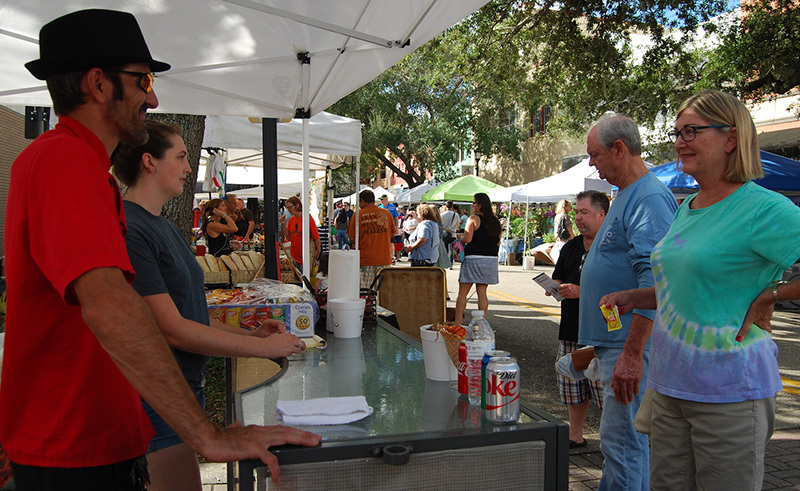 Every Saturday from October through May residents of Manatee County and beyond meet on Old Main Street in downtown Bradenton to carry on this tradition at the Bradenton Farmers’ Market. Not only are more than 35 vendors selling produce, seafood and meats, prepared foods, and art for the almost 3,000 visitors, they are mingling and talking with the close friends they have made at the market. “It’s a good place to socialize,” said Gene Ticconi, who with his wife, Darlene, has a spot on Old Main Street where he sells Jay’s Italian Olive Salad. “We’ve met vendors and customers and went out to dinner with them,” said the Colony Cove resident. Ticconi said he has been selling the jarred specialty olive salad from Jay’s Market Place in St. Petersburg for six years, and for the last three at the Bradenton Farmers’ Market. “It’s a nice way to spend Saturday morning,” he said. It seems making friends and meeting new people are big incentives for a lot of the vendors. The Warner Robins, Ga., native, moved to Bradenton 10 years ago when he was on his way to Key West. At the Split Fire Grill booth customers can order from a menu that may change from week to week because many of the sandwiches are made from items purchased at the farmers’ market. One mainstay on the menu is the Farmers’ Market Sandwich, made with fresh eggplant, Cajun onions, and peppers from any one of the produce vendors: Gouda from B&J Enterprises; garlic rosemary bread from Olive Branch and More; and honey drizzle from Pure Florida Apiary. 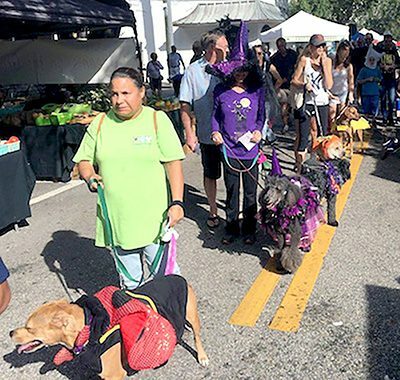 Visitors to the Bradenton Farmers’ Market last year got a treat when pet owners paraded their pets dressed in their favorite costumes down Old Main Street for Howl’ween. Anderson, who has been at the farmers’ market for four years, said he promotes other businesses at the market more than himself. “I use the burgers from Sarasota Beef Company,” he said, “and the fish from Liz’s Seafood Market. Two of the vendors who have been selling at the Bradenton Farmers’ Market from the beginning are from north of the Manatee River — Sheppard’s Farm in Terra Ceia and Milagro Produce in Palmetto. Roanie Sheppard Jr., said his father, Roanie Sheppard Sr., started the farm off Bayshore Road more than 30 years ago. 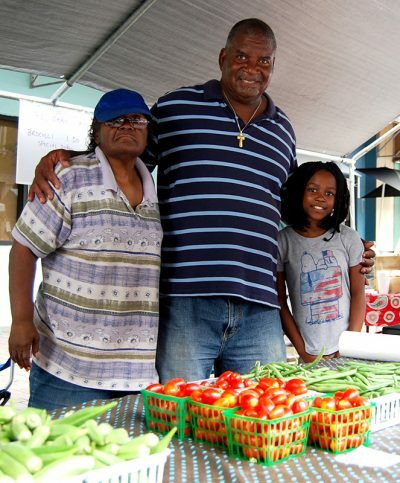 His brother, Moses Sheppard, now owns the farm, and Roanie helps him out at the market. The farmers’ market is popular with the area’s northern visitors. Yvette Martinez, who owns Milagro Produce with her son, Tony Martinez, said she has been in the produce business all her life. “I worked with my mother, who was a crew leader on a field crew that picked produce,” Yvette Martinez said. Martinez and her family still go to local farms to pick the produce they sell every week. Geraldine Joes, left, helps her cousin, Roanie Sheppard Jr., and their family friend, Desiree Buckley, 10, at the Sheppard Farms booth at the Bradenton Farmers’ Market. Martinez has been coming to the farmers’ market every Saturday for more than 20 years. The Bradenton Farmers’ Market has been in downtown Bradenton for around 20 years in some configuration or another, said Peg Haynes, who has been market manager for four years. Realize Bradenton, a nonprofit organization that promotes redevelopment and economic growth in downtown Bradenton, has been producing the market since 2011. Since then, the farmers’ market has been a huge success. The number of vendors has about doubled under the direction of Realize Bradenton. During the four years Haynes has been manager, the number of vendors has increased 25 to 30 percent. “Opening day this year (Oct. 7) had been exceptionally good. We had nearly 5,000 visitors,” Haynes said. “Last week (Oct. 14) was a little more typical with about 2,700 visitors,” she said. That success could be because of Haynes’ enthusiasm for the farmers’ market. And second, it’s a good way to entertain one’s self,” Haynes said. “You can spend a couple of hours shopping, listening to music, watching demonstrations and having a bite to eat,” she said. Many of the vendors, such as Split Fire Grill, sell sandwiches and other carry-away food items, and most of the restaurants along Old Main Street are open. “Local business along Old Main are happy to have us there on Saturday, especially the restaurants,” Haynes said. Several of the restaurants have outdoor seating, and Haynes said this allows visitors to enjoy the atmosphere. “They can people-watch, and the outdoors tables keep them downtown longer,” she said. And this Saturday (Oct. 28), farmers’ market visitors cannot only people-watch, but pet-watch, also. Howl’ween, an annual pet costume contest and parade on Old Main Street, will be held with registration at 10 a.m., and the parade stepping off at 10:30 a.m. The parade will be followed by photo and selfie time at 11 a.m., and prizes will be awarded around 11:30 for Best Overall, Most Scary, Most Creative, and Most Funny. Howl’ween is one of the weekly events Realize Bradenton promotes at the Bradenton Farmers’ Market, such as every third Saturday during an event called Mainly Art, local artists and craftspeople display and sell their artwork and creations. Also, there are live bands performing every Saturday. 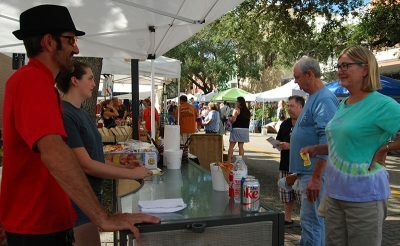 For a listing of all the events and market vendors visit the website at www.realizebradenton.com/farmers_market.